In 2003, Hurricane Isabel almost crippled the Langley Air Force Base in Hampton, Virginia. Over 200 of the military facility’s mechanical systems flooded, and 35 percent of buildings and 22 percent of aircraft engines were damaged. Runways were flooded and lights were knocked out. The base sustained $166 million in flood damage. Because the base is surrounded by water, the Air Force recognized the need for protection from future flooding as sea levels continue to rise. It constructed a $5 million 3,000-foot-long seawall around the base, placed electrical infrastructure in huge cement blocks, built steel door dams on buildings at risk of flooding, and installed a $5 million groundwater pumping station to get rid of floodwater. While the White House denies that climate change is happening, the military has been aware of the risks of climate change since 1990, and has been actively working for a number of years already to avoid and adapt to the worst effects of climate change, including flooding, extreme heat, extreme weather, and more. Langley-Eustis (The Langley Air Force Base merged with the Army’s Fort Eustis in 2010) is just one of 128 U.S. military bases and installations that could be threatened by a three-foot sea level rise, which could occur by the end of the century. Rising seas could have profound effects on military operations. 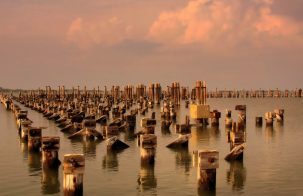 According to a 2016 report conducted by a military expert panel and published by the Center for Climate and Security (CCS) policy institute, sea level rise could flood parts of military bases along the East and Gulf coasts for up to three months a year as soon as 2050. This could affect military infrastructure, training, and operations. 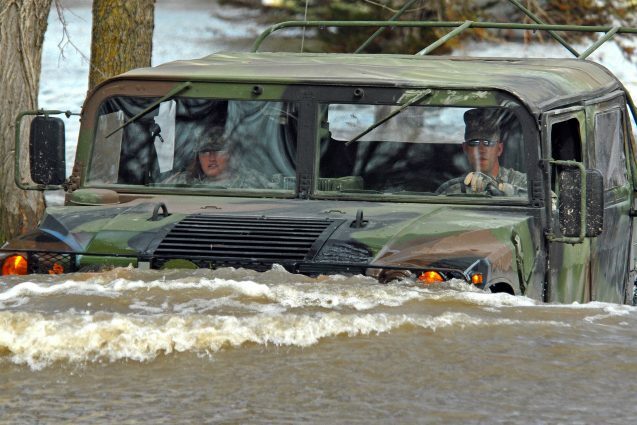 Sea level rise and storm surges could interfere with amphibious landings and navigational safety, and cause power outages that affect transportation, command and control, and intelligence centers. And around the world, sea level rise will cause more flooding, which could result in the military increasingly being called upon to provide humanitarian aid or disaster relief. Sea level rise and ocean acidification will also threaten fish stocks and compromise agricultural coastal land, which could displace populations in many regions, prompt mass migrations and destabilize vulnerable countries. The CCS’s military expert panel report recommends that the military take sea level rise risk into consideration when planning infrastructure, operations, and strategy; that it play out catastrophic climate scenarios when planning; make decisions only after considering the worst climate risks possible; track climate trends as the forecasting technology improves; and collaborate with civilian communities and international counterparts to deal with climate change impacts. The Naval station Norfolk in Portsmouth, VA, the largest naval base in the world, already floods ten times a year when full moons cause especially high tides—sea levels there are one and a half feet higher than they were when the base was built in 1917, and rising twice as fast as average global sea levels. By 2050, Norfolk is expected to flood 280 times a year. Now when new buildings are to be built within six and a half feet of expected sea level rise, the Navy requires that they provide special justification, and install flood barriers and backup systems to cope with rising sea levels and storm surges. Some piers at Norfolk have been replaced with utilities situated on upper decks at a cost of over $1 million each; backup generators are also being placed on elevated structures. In 2009, the Chief of Naval Operations created Task Force Climate Change to make recommendations for policy, strategy, organization and investments about climate change and the Arctic. The Navy’s ships, submarines, aircraft, naval bases, and technology, worth tens of billions of dollars, take years to design and build, so it must plan decades ahead. And of all the branches of the military, it has the most assets at very high risk due to sea level rise and storm surges, especially piers and electrical substations and communications systems, most of them on seacoasts around the world. Replacing these assets would cost $220 billion. The Marines comprise the majority of active duty forces at Camp Lejeune near Jacksonville, NC. According to a Union of Concerned Scientists study of military installations and sea level rise, seas around Lejeune could rise between 3.7 and 6.1 feet by 2100. In a worst-case scenario, some parts of the camp would be under water more than 90 percent of the time by then. The Marine Corps Recruit Depot Parris Island installation near Beaufort, SC might also be almost completely flooded by 2100. 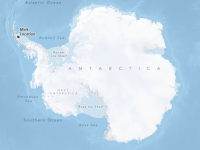 The study concluded that in order to figure out how to cope with these challenges, the military needs more detailed analyses of how sea level rise will affect the individual bases as well as the resources to implement the solutions. But sea level rise is not the only flooding risk to the military’s installations. Inland installations near rivers are also vulnerable, because they can overflow with heavy precipitation, which is expected to become more common as the atmosphere warms. David Farnham, a PhD. student in the Earth and Environmental Engineering Department at Columbia University and the Earth Institute’s Water Center, is working on a project for the Department of Defense to predict flood risk at military facilities and projects in the Ohio River Valley for the next 50 to 100 years. 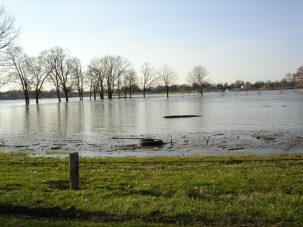 Collaborating with the University of Massachusetts Amherst, the National Center for Atmospheric Research, and the U.S. Military Academy, the Water Center is looking at inland river flooding in the Ohio River Valley because there are several military installations there and the area has a history of flooding that is often associated with periods of heavy precipitation. “We use statistical methods, historical precipitation and atmospheric data, and dynamical climate model simulations to try to project future patterns of precipitation, as well as the uncertainty of those patterns,” said Farnham. While the project is still in its early stages, the researchers have found preliminary evidence that the frequency of intense precipitation events associated with flooding will increase throughout the next century. One of the outcomes of this project will be updated Intensity Duration Frequency (IDF) Curves. In this case, intensity refers to how many inches of rain you get in a set period of time. Duration means how long the storm lasts, and frequency means how often a storm occurs, Farnham explained. “The curves are used for design standards. We think these IDF curves in reality are changing over time, so we want IDF curves of the future that are actually conditioned on climate variables.” Updated curves will enable future buildings to be designed to meet future conditions. Since every region has its own particular circumstances and therefore projections, however, the Department of Defense would need numerous targeted studies like this to figure out how to make its many installations more resilient. The goal of the Water Center project is to build a methodology that could be easily translatable and applicable to other locations. The project is one of many managed under the Defense Department’s Strategic Environmental Research and Development Program. It conducts hundreds of research projects in areas including resource conservation and resiliency, environmental restoration, and energy and water. Many of the projects are aimed at developing the science, technologies, and methods needed to help the Defense Department manage the challenges of climate change. Rising temperatures and extreme weather events will threaten military training, disrupt supply chains, result in higher heating and cooling costs, and could affect intelligence, surveillance and reconnaissance capabilities. Warmer temperatures will increase the incidence of pests and disease, stress land and water resources, and exacerbate health and safety risks for military personnel and people around the world. Army Sgt. 1st Class in airborne training. 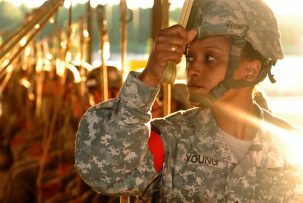 To achieve readiness, the Army must train its soldiers for all kinds of conditions and operations. 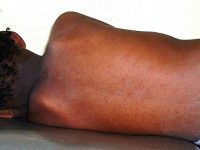 Heat hinders the performance of soldiers and could limit the number of days that it is safe to conduct operations and training exercises such as calisthenics, crawling, field assaults, or constructing defenses. Heat-related injuries and respiratory problems from poor air quality may necessitate new engineering solutions and more pharmaceuticals in the field. Extreme weather will necessitate more maintenance and repair for runways and roads, infrastructure and equipment. It will also result in more need for the U.S. military’s humanitarian assistance and disaster relief around the world because climate change will worsen problems of hunger and poverty in vulnerable populations. Food and water shortages, more disease, damaged infrastructure, power outages and displaced people will intensify competition for resources and increase tensions, creating new risks to U.S. interests that the military will have to protect. The Arctic is warming twice as fast as the rest of the planet. As one of eight countries on the Arctic Council, the U.S. helps promote cooperation among the Arctic states. The melting of sea ice is opening the Arctic Ocean up to new opportunities for oil and gas exploration (the Arctic is thought to have 20 percent of global oil and gas reserves), fishing, and tourism. All this unprecedented activity in the region will make more monitoring necessary to ensure the free passage of ships, the safety of people working there, and the protection of the environment. It could also mean more conflicts. To prepare to operate in the Arctic, the Navy conducted ICEX2016, training exercises in the Arctic Ocean to research and test its capabilities there. It plans to increase cold weather training so that sailors have the necessary expertise, and will ensure that infrastructure, equipment, communication systems and weaponry can withstand the extreme climate. More icebreakers will also be needed to navigate through the thinning ice; the U.S. only has five while Russia has 41. 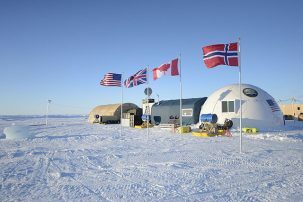 The Army, too, must provide specific training to operate in the Arctic with more cold weather training and training for the aerial delivery of supplies. Vehicles and transport have to be capable of operating in rough terrain and snow, and equipment and weaponry must be able to withstand extreme cold. The number of renewable energy projects in the U.S. military almost tripled between 2011 and 2015, with many of them enabling bases to be energy independent in case of a natural disaster or attack. The use of distributed renewables at bases reduces the possibility of disruptions in procuring energy, and increases resilience in case of cyberattacks on the grid. The Army’s goal is to get 25 percent of the energy it consumes from renewable sources by 2025, and to be net zero by 2030 (meaning it will generate as much energy as it uses). 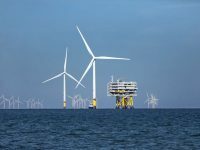 In 2015, it derived 12 percent of its energy from renewables and by 2016 had 17 large renewable energy projects in development. The biggest U.S. military base, Fort Hood in Texas, is already drawing almost 50 percent of its power from renewable energy, with 63,000 solar panels on site and 21 off-site wind turbines producing 65 MW of power. This is expected to save more than $100 million over 30 years. The Army Net Zero initiative created 17 pilot installations around the country which, at the end of 2015, had reduced energy use by 5 percent and generated 28,700 MWh of renewable energy, most of which was consumed at the bases. It also reduced potable water consumption by 11 percent and recycled and harvested rainwater, saving 89 million gallons of water. The Navy aims to get 50 percent of its energy from alternative sources by 2020, and for half of its installations to be net zero by 2020. According to Stars and Stripes, the Navy was already getting almost 50 percent of its energy from renewable sources in 2016. 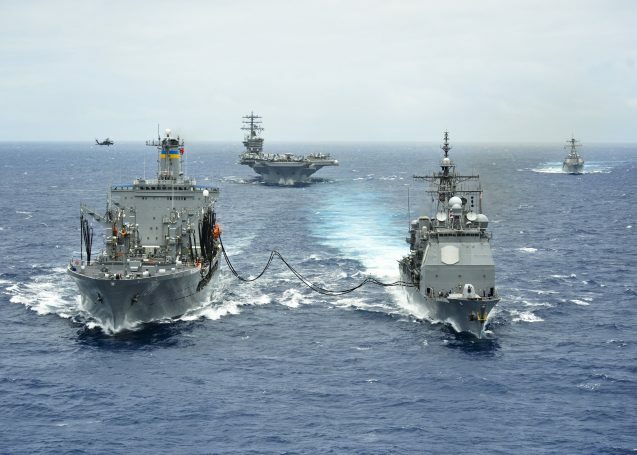 The Navy’s Great Green Fleet was a 2016 initiative enabling ships and aircraft to operate on a blend of half biofuel, half petroleum. The fleet also used energy efficient systems, such as temperature controls, LED lighting and stern flaps beneath the vessel to reduce the drag and resistance in water, all of which allowed the fleet to operate farther for longer periods of time. Last year, some destroyers were equipped with gas-electric hybrid engines, which save fuel and result in fewer refueling stops, making them less vulnerable to attack. The Naval Research Lab is also studying the viability of solar-powered unmanned aerial vehicles, which could enhance their ability to do 24/7 surveillance and reconnaissance. By 2020, the Marines aim to get 50 percent of their energy from alternative sources, and to make half their installations net zero by reducing demand and using on-site renewable energy. As of 2016, almost 50 percent of their energy derived from renewable sources. To make the Marines even “leaner, meaner and greener,” the Marine Corps’ Expeditionary Energy Office wants all small units to eventually be self-sustainable in terms of energy and water. Two outposts already no longer use any fuel at all. The Ground Renewable Expeditionary Energy Network System enables Marines to go completely off the grid without a generator. It uses solar panels and high-density batteries, and the Marines are currently looking into the possibility of incorporating wind power, too. 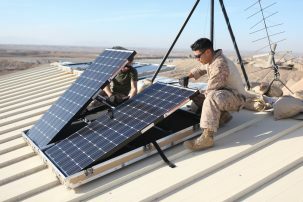 Marines installing solar panels in Afghanistan. The Solar Portable Alternative Communications Energy System consists of folding portable solar panels, which are used to power batteries for communications, night-vision goggles and GPS. It enables the Marines to turn off generators and operate more stealthily. Both systems were used successfully in Afghanistan in 2009. The Air Force’s goal is to get 25 percent of its electricity from renewable or alternative sources by 2025, and ensure that all new buildings are net zero by 2030. 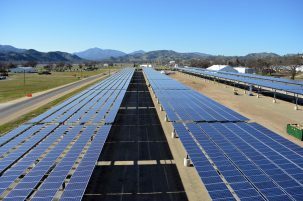 According to the Deputy Assistant Secretary of the Air Force for Environment, Safety and Infrastructure, the Air Force base of the future will be powered with on-site distributed energy and smart microgrids. Towards that end, the Air Force has been reducing demand for energy, increasing its supply of renewable and alternative sources, and changing its culture. One example is its use of more fuel-efficient engines in C-5 Galaxy military transport planes; they no longer need to stop for refueling. “[E]ach gallon saved is a gallon not transported,” said General Norton Schwartz in 2010 when he was Chief of Staff of the Air Force. The Department of Defense established the foundation for strategies to deal with climate change’s impacts in its 2010 Quadrennial Defense Review Report. The 2014 review stated that efforts “to increase energy and water security, including investments in energy efficiency, new technologies, and renewable energy sources, will increase the resiliency of our installations and help mitigate these effects.” And the Defense Department’s 2014 Climate Change Adaptation Roadmap established goals to identify the effects of climate change on operations, training, infrastructure, and supply chains, and to integrate climate change whenever considering risks in these areas. The military recognizes that if it is not prepared to meet the impacts of climate change, missions will be more expensive, take more time, and could be compromised by the lack of necessary equipment or expertise at crucial points in its operations. Ultimately, its very ability to defend against enemies and protect American interests is at stake. I keep hearing that climate change is natural and so we shouldn’t even try and change the outcome. I don’t agree with this in the slightest. Whether it’s natural or man made, the result is the same: vast tracts of land will become uninhabitable. Even though we aren’t guaranteed to succeed, it’s worth using all the tools in our arsenal, whether it’s drones or pollution reducing strategies. In my opinion, rather than the perpetual war cycle the U.S. is locked in that only brings more terrorism and refugees to the states, the U.S. military should be training other military forces around the world in disaster prevention and addressing climate change. Senator, the Navy, from my briefings to date, is totally aware of the rising water issue, storm issues, et cetera. We must protect our infrastructure, and I will work hard to make sure we are keeping an eye on that because without the infrastructure, we lose readiness. I think they aware about the rising water issue and many issues we facing nowadays. Protection of infrastructure is mandatory before and in present scenario too. Dear US Military, Please train our men who are interested in the military to their full potential and teach them as well as other armed forces around the world how to prevent disaster and address climate change. It will help us go a long way. Climate change is now everywhere and every country has its own way to adapt to the new living conditions. Actually the US has done many better things than a lot of countries in Asia already. The governments in certain places are just ignored…Sadly speaking. And yes the politicians can bring about actions that will slow, stop and reverse climate change crisis, but they are so beholding to the polluting fossil fuel interests, that there is little hope that this current Congress will do what is right. The U.S. military does so much more than fight in wars. It’s important to remember that efforts like this are an important reason why so many US tax dollars go to the military. A more likely outcome is that Trump continues to lay waste to domestic regulations and international cooperation on climate, leaving the US with a DE-fact military-only climate policy. This is something close to a dystopian outcome, especially if it catches on as the post-denial conservative position on climate. That’s my worry: that the terminal gridlock of US domestic politics will leave us with climate policies that do little but prepare us to dominate a more violent and unequal world. I continue hearing that environmental change is normal thus we shouldn’t attempt and change the result. I don’t concur with this in the smallest. Regardless of whether it’s common or man made, the outcome is the same: immense tracts of land will wind up appalling. I think, worst effects of climate change increasing day-by-day and extra flooding, extreme heat, cyclone, as of many other issues issues we are facing all over the world. We know Every Country has its own country budget and GEF’s budget to protect the climate change. Japan is the the first contributor in the GEF’s and United states is the second-largest contributor in the Global Environment Facility. the US government with the us military has done many better things than other. I think One of the best good sign of US Army for doing about climate change. I don’t know others people what think about It. Personally, I think they are well aware of the rising water issues as well as other issues we are facing these days. It can not be over stressed, the protection of infrastructure is mandatory before and in present scenario too. Using the pump to remove flood water is a temporary solution. 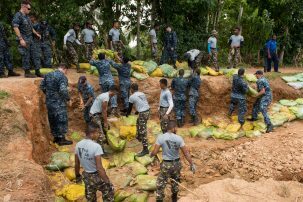 US military should give a report to the government on improving the funding to those flood-prone areas. And I really wish that our president sits with the World climate change groups. Neglecting the fact about climate change is only going to make things worse. We are not far from the days when having a powerful AC in your home will become mandatory. be most useful undertaking rather than the perpetual war cycle the U.S.
new role for the military everywhere. The irony is that it is now quite clear, based upon the job-creating statistics, that the transition to renewable energy is literally a 3rd Industrial Revolution. There are now 2X more jobs in solar energy alone that the entire fossil fuel industry sector, coal, oil, and gas!